In Thailand, Muay Thai has traditionally been considered a sport of the lower classes. Its boxers tend to come from more rural farming regions, with fighting a means for young boys to earn money and—if they go on to excel at the sport—potentially secure income that far exceeds what would otherwise typically be available to them. Despite some recent changes in trends (for example, over the last year or so I’ve noticed increasing numbers of more middle-class Thais and university students joining my gym in Bangkok), this stereotype does seem to prevail. Last week Muaythai Journal Episode 7 “Social Mobility” was released, focusing on the social aspects of Muay Thai and upward mobility through fighting. In this episode, John Wolcott (director) takes an interesting change in style direction—using audio commentary provided by Abigail McCullough (foreign representative at Sitmonchai Gym, Kanchanaburi) over a backdrop of photographs taken by Jacob Klensin (Figure of Fighting) at Lookchaomaesaithong Gym, Buriram. These photographs portray life in a gym in Isaan (Northeastern Thailand)—the area from which the largest percentage of Thailand’s Muay Thai fighters hail—while Abigail (who has been based in the country for several years) shares her knowledge on sociocultural trends within Muay Thai. The boxer shown kicking the pads in the closing scenes is my Eminent Air Boxing Gym team mate Bpragaipetch Sagami (nicknamed Dtang). Dtang’s story is remarkable. He was born without a left hand though this deficit hasn’t prevented him from pursuing his dreams of being a boxer and achieving relative success in his chosen career. Dtang has competed against some of the top ranking Thais at his weight and most recently scored an impressive win against Yothin Sakaethongresort at Lumpini Boxing Stadium on 5th March (watch the fight here). Becoming quite the star of screen, Dtang featured in two other documentaries last year. One was “Fight Club Asia”—a 3D documentary first screened by National Geographic Channel Asia in July 2012. The other was “The One-Handed Fighter”—a short film produced by a group of media students, one of whom—Sasin Soonthornpusit—trains at Eminent Air in his spare time. “The One-Handed Fighter” is a charming piece of film that captures Dtang’s warm and modest personality. In it, he describes his beginnings in Muay Thai, recounts tales of teasing and bullying, and firmly states his sporting ambitions. His interview scenes are interlaced with footage at Eminent Air and at Lumpini, providing the viewer with glimpses of gym life and the stadium environment. 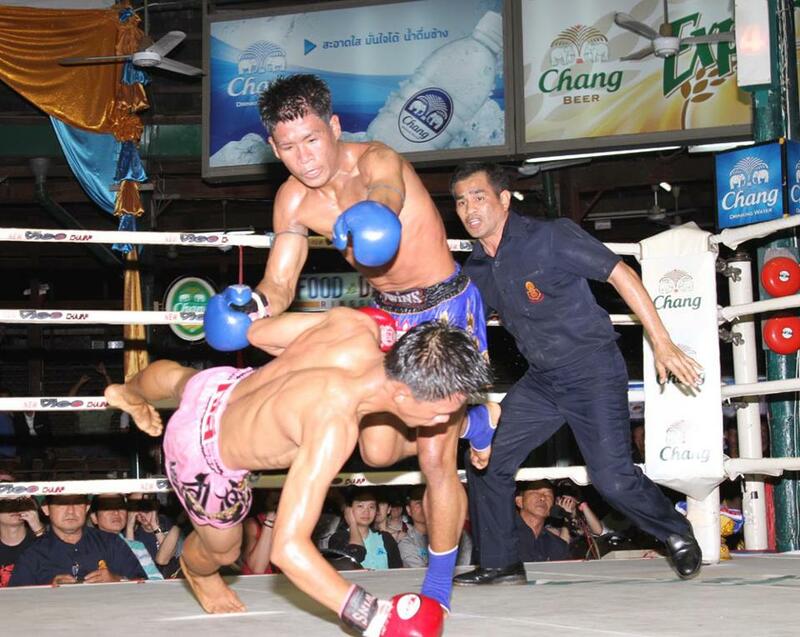 Dtang’s story provides a fitting example of social mobility through Muay Thai. In the past, he has mentioned that he feels being a boxer brings him respect from others and an income that probably wouldn’t be attainable if he worked a regular job. If he hadn’t become a Muay Thai fighter, what options would have been available to him? “Social Mobility” and “The One-Handed Fighter” are two excellent documentaries, linked by one common character. Both provide insights into sociocultural aspects of Muay Thai, as well as highlight the talents of one extraordinary individual. Figuratively, Dtang has probably had to fight more than most to be where he is today and has shown determination throughout. His standout statement from “The One-Handed Fighter” is one that cannot fail to inspire. Do you think that the current trend of middle and upper class Thais being interested in muay thai has anything to do with Buakaw’s success and his current prevalence in the media? I’ve been surprised at the type of media exposure he’s been getting, for example, fashion spreads with models. My impression is that press coverage differs from what I remember it being before he left Por Pramuk – i.e. perhaps the current is one moreso of inclusion. ? I have no idea, but I’m curious about your thoughts and/or if any of the local newcomers to your gym have mentioned anything. I met a middle class Thai male in Buriram at a fitness gym that wasn’t aware of the level of muay thai fighters in Buriram (this individual was from Buriram). He knew a lot about MMA and about Buakaw but didn’t actually know much about muay thai. I later brought him to Lookchaomaesaithong Gym in Buriram. (The nak muay you have in the Klensin photo was my clinching partner). I think very much that the Thai Fight promotions and Buakaw’s success have succeeded in increasing the popularity of Muay Thai among more middle class Thais. I don’t always like the Thai Fight match ups but the promoters do put on great shows with entertainment value and mass appeal. When the camera spans the audience, you can see many women and “hi-so” Thais that you perhaps wouldn’t see at an ordinary night at Lumpini, for example. I do agree Buakaw’s media coverage has changed since leaving Por Pramuk – more showbiz perhaps with the TV interviews, magazine shoots etc (even Vogue! ).